It has been a busy fall. By the time the Christmas break rolls around we will have completed 32 school visits, 21 classroom observations, 7 model lessons, 14 Webinars, and 9 PD sessions. It is always an honor to learn from each of you and then, in turn, share my thinking and experience. I love our profession, and have the utmost admiration for the commitment you have made to our students. Each of you is somewhere between Unit 2 and 3 in our Concept English 6-12 grade curriculum. Depending on your circumstances, this may vary. If you need help planning or implementing, please ask. We have really enjoyed developing lessons this year and modeling them in the classroom. You will be hearing a lot about rigor and relevance from us in the next 6 months. 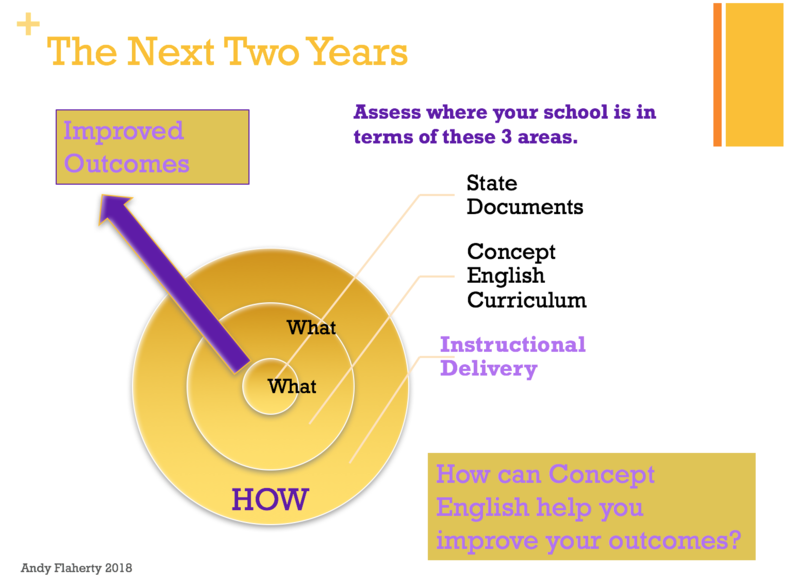 Whether you think in terms of Bloom or Webb’s Depth of Knowledge ALL our states are requiring higher level thinking in our instructional delivery to master the standards. It is not enough to know the standards you must know the level of rigor being addressed in each standard. If you think about the complexity of your tasks, and how students use information for a specific purpose you will be on the right track. Knowing your statement requirements will eliminate the need to discuss why the Collections text is so hard (it is supposed to be). It is time to move beyond the what (books and resources) and dive into developing our instructional delivery. The only way to discuss and understand your data and how to target your re-teaching, is to be very clear on what is expected. 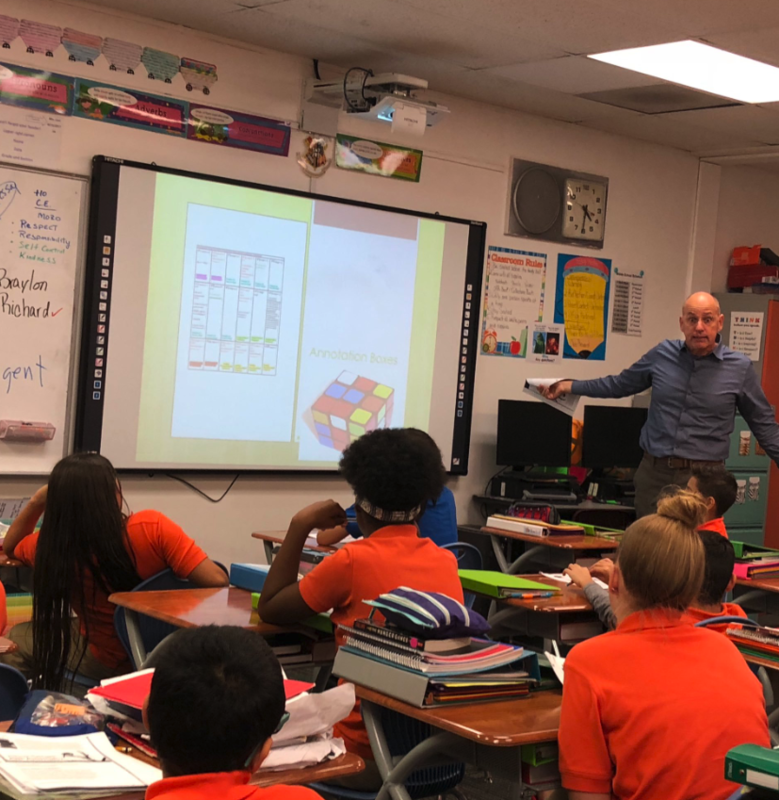 We have begun reaching out to principals, and will be presenting to APA’s this week and asking for a commitment to strategically target levels of rigor in the standards. In the sample below it has become very clear why students may be struggling with the 8th grade standard RI.8.4 (vocabulary). 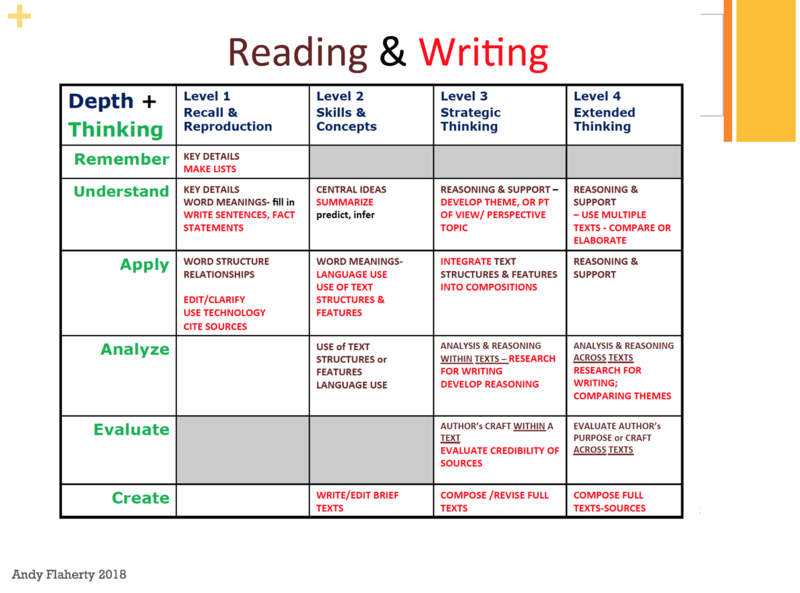 ODE tells us the levels of questions and we know our states tests expect higher level thinking 50% of the time (represented here by DOK Level 2 questions) on standardized tests. Have you looked at the documents below? What are your state’s version of these? If you have not, we can help you find them. We will offer you, your Principals and APA’s support in terms of identifying, interpreting these documents, and then planning instruction from our curriculum based on these guidelines that is more rigorous ways. When we see teachers moving from level 1 to level 2 and 3 in terms of instruction our success will speak for itself. Some of you have already been working on this in your Department meetings. 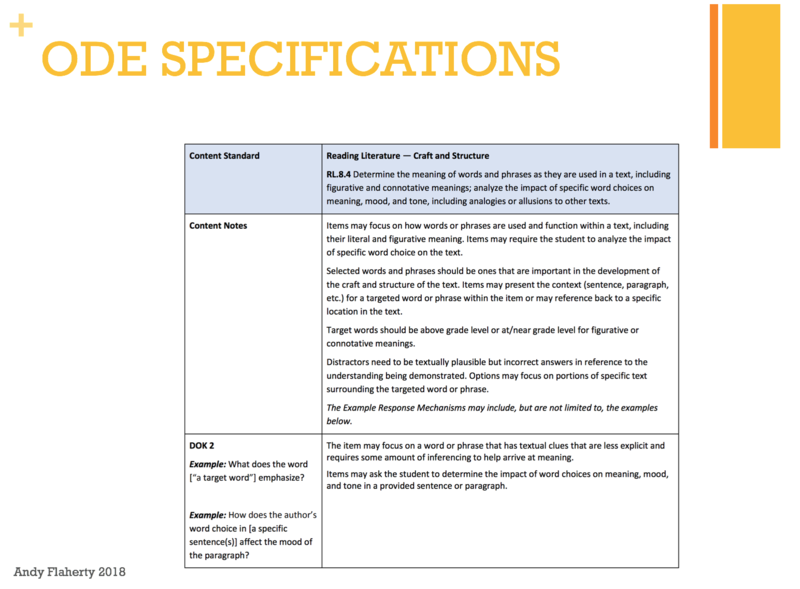 Below, right, is a document that explains rigor in terms of Bloom (left) and DOK (top) for Reading Information, laid out for us by the Center for College & Career Readiness. 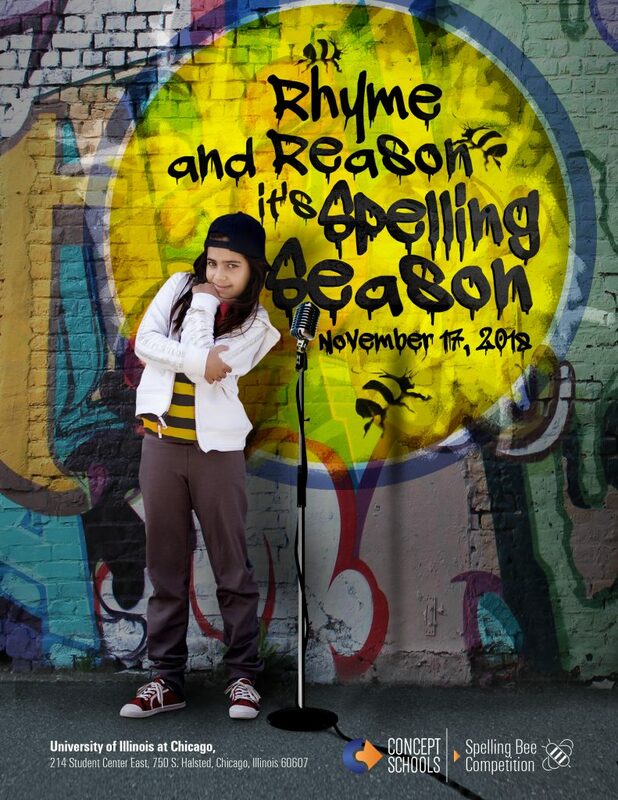 November 17th at UIC in Chicago is our annual spelling bee. We have 101 students coming to Chicago to participate. In addition to new judges, we have made changes to the program based on your recommendations that we offer different food and provide an opportunity for students to get see our beautiful city. Writing Competition. We have been so busy that the themes remain undeveloped. However, we had already decided that this year’s focus would be on Poetry so why not link it to April, which is National Poetry Month. Our new deadline is going to be March 29th instead of February 28th. You will receive themes/directions/guidelines no later November 3oth. 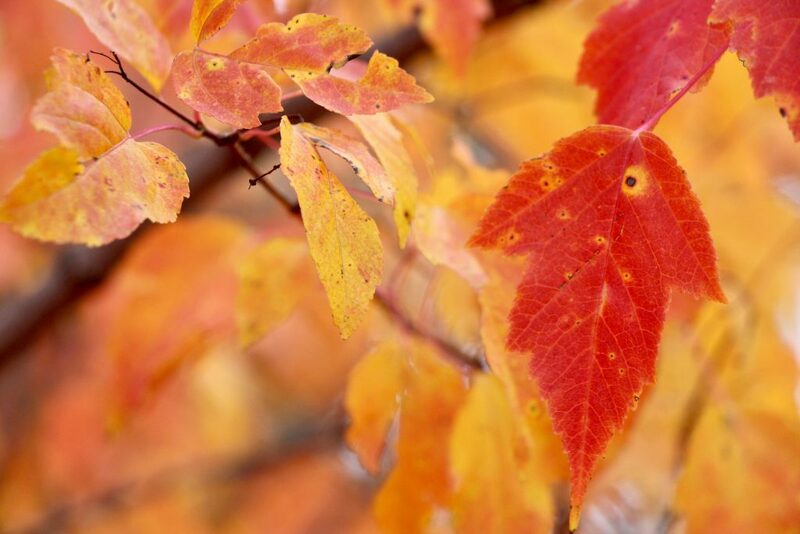 We hope you have a wonderful month and Happy Thanksgiving.